Downtown Hartford will see its newest urban hotel opening in June | Vandewalle & Associates, Inc.
HARTFORD, WI (excerpts from gmtoday.com)-– The opening of the new Cobblestone Inn and Suites in the city’s downtown is tentatively scheduled for June 13-14, and a grand opening celebration tentatively set for June 19. The hotel project is part of the most recent Hartford downtown redevelopment effort, which started in the summer of 2015. At that time a coalition of nonprofit, government, and private groups hired Vandewalle and Associates, a Milwaukee/Madison based redevelopment and urban planning expert, to produce a downtown redevelopment strategy. Together, the team developed a plan that was adopted in February 2016 and is already translating into real development and improvements downtown. Mayor Tim Michalak said the hotel is a sign of how the downtown is being completely revitalized. “This is great news for the city,” Michalak said. 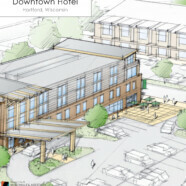 “Progress is being made in the downtown with the TIF District that the Council wisely set up. The TIF proceeds will help invigorate the investment necessary to make sure Hartford does what it needs to attract and retain business and again to make it such that Hartford retains its place as a location to work, live and play.” Michalak said the completion of the hotel and other downtown redevelopment projects shows people coming into Hartford “are seeing what we are doing for the downtown and understand that they want to be part of the downtown and they are moving here.” Read the full story here.